Take a look at an overview of our services below! We’ll be happy to help you with any of your Computer Consultancy needs. IT needs to be entrusted to an independent professional with the experience and knowledge to be able to advice, plan, design, install and support the complex IT systems, with integrated cloud services, smart phones, internet telephony etc. Many a time, businesses may entrust their IT services to various third parties who are focused on selling more hardware and services, regardless of function or suitability. Reduce the risk of IT investment by asking Bishop Consultancy UK Ltd. For a second opinion on IT projects. Do you really need it? Is it the best solution? Is the price right? Are the suppliers competent? At Bishop Consultancy UK Ltd, we can be an independent reviewer and give you a reliable second opinion, which will enable you to make your own decision about what your company really needs. 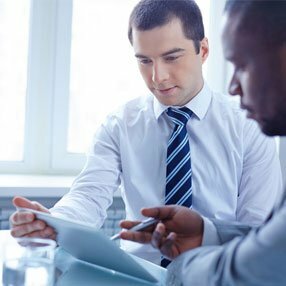 Armed with years of experience and vast knowledge, Bishop Consultancy UK Ltd is what you need when you decide to go for professional IT consultancy services. In other words, we can become your Virtual IT Manager or Director. Getting the right help at the right time can save you a lot of time and money and help avoid costly and disruptive mistakes. We have over 25 years’ experience in resolving all types of network problems, for both wired and wireless connections. We use the latest tools for diagnosis and can analyse various types of firewalls and network switches. Our team focuses on providing a fast and efficient service while capturing, analysing and disassembling traffic and document network schematics. At Bishop Consultancy UK Ltd, we have the expertise to monitor wireless frequencies for range, strength and interference. This can help improve connectivity and speed up your network. Our advanced tools also help us identify the source of signal interference and we can rectify it for you. As well as network diagnosis, we also provide wireless surveys in Essex, Suffolk and the surrounding counties. Contact us today for more help! If you are planning to extend your current wireless system or are planning to install a new system for your building. 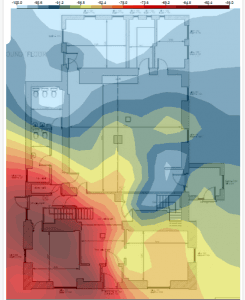 We can undertake a wireless survey of all or part of your building. We serve Essex, Suffolk and the surrounding counties. The survey you can see first here is of a very old building with very thick walls and although the image clearly shows two access points, the image was created from separate surveys, each using a single access point. 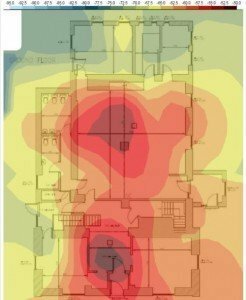 This image shows the signal strength (in dBm) and coverage provided by utilising just two access points. Wall thickness prevents a strong signal reaching the top two offices, so consideration would need to be given whether two would be enough. In this case, these rooms were used for storage and kitchens, so no signal was required. This image, which is the second image of the two, demonstrates interference (in dBm) on one channel of 802.11g. The interference affects 3 channels overall and is strong enough to cause serious connectivity issues in the affected room(s). The source of the interference was easy to locate and could be avoided, or removed. Without the survey, this interference would have caused considerable issues. We can survey one room, or an entire building or campus, e.g. healthcare or education. You can also rely on us for the planning of new networks based on the test results. At Bishop Consultancy UK Ltd we will analyse your business requirements and the company’s strategic goals and draw on these factors & build IT Strategy or roadmap to build your future network. We will provide our expertise to make sure your projects can progress in-line with technological advances. 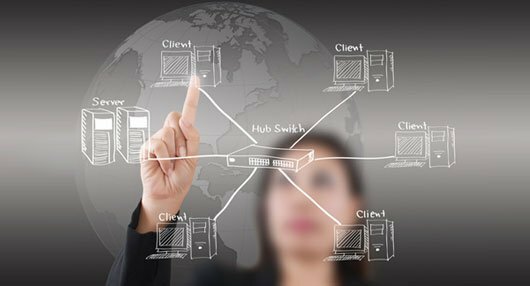 We will fully support you through all stages of your network project, making sure your business requirements are fully met at each stage. We can design networks from the ground up or plan and design complex upgrades ensuring minimal downtime. 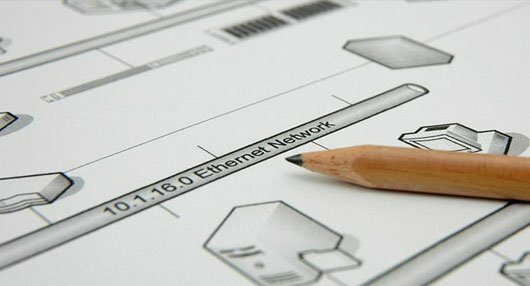 In addition to designing and installing we also have a wealth of experience in upgrading, redesigning and maintaining existing networks and infrastructures. In addition to wired networks, we also offer a wireless network design and installation service. We can handle everything from a small office wireless network up to larger wireless networks covering a large building, site or campus. Large wireless networks will usually start with a full site survey to help us to review signal strength, coverage and performance.